Tungsten Carbide Disc 2″ (50mm) diameter x 10mm center, flat profile, abrasive disc. Garnet – Fine Grit – Merlin Disc Accessory. Also great for stone carving. The Ultimate miniature woodcarving Set! 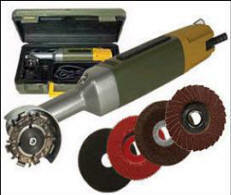 Includes mini grinder and five incredible accessories in a molded case – all you need to start and finish your projects. Proxxon long neck mini grinder with full wave, electronic variable speed control (3,300-13,000 rpm). Five included 2” (50mm) accessories make this set ideal for start to finish detail on wood working and carving projects. (Silicon Carbide Grinding Wheel, Flat Profile Tungsten Carbide, 100 Grit Fan Sander and Carborundum Metal Cutter). Smooth cutting and excellent control in tight, difficult to reach places. Achieves new creative finishes. Easily change accessories with the Allen Key (included) and lockdown spindle button in the die cast housing. 2″ (50mm) diameter x 10 mm center, Sander fits all Merlin / Proxxon Grinders and most Mini Grinders. Aluminum oxide for for superior material removal on tempered cast iron, stainless steel, non-ferrous metals, wood and plastic.